It’s the season of fresh fruits and vegetables. Yay! My younger sister is passionate about fresh produce (me too!). In fact, her alter-ego, Delvina May, created a "Veggie wRap" for your entertainment. Enjoy! Four years ago I ended my relationship with a skincare line I loved and had used for 25 years. I never thought I would switch to any other brand, but because I have become more interested in natural, organic products, when I came across the Annmarie Skin Care line I ordered a $10 sample kit. After using it for just a few days, I noticed a significant improvement in my complexion, but I had my doubts because I didn’t expect to see immediate results. I have never received an unsolicited compliment on my skin nor have I expected it because I am in my 50s. However, during the time I was trying out the sample kit, I was shopping and a woman whom I did not know approached me and told me several times I had beautiful skin! I was shocked that someone else noticed. Well that experience sealed the deal and I promptly ordered full sized bottles of Annmarie’s product. The $10 sample kits come with a $10 discount coupon to apply toward an order of full size product. The company offers a complete money-back guarantee, so if you don't like the product, they will refund your purchase. Most people think I am very organized and tidy. The reality is, I just know how to use furniture to my advantage. I organize in piles so when purchasing a piece of furniture I evaluate how well it will hide my piles. 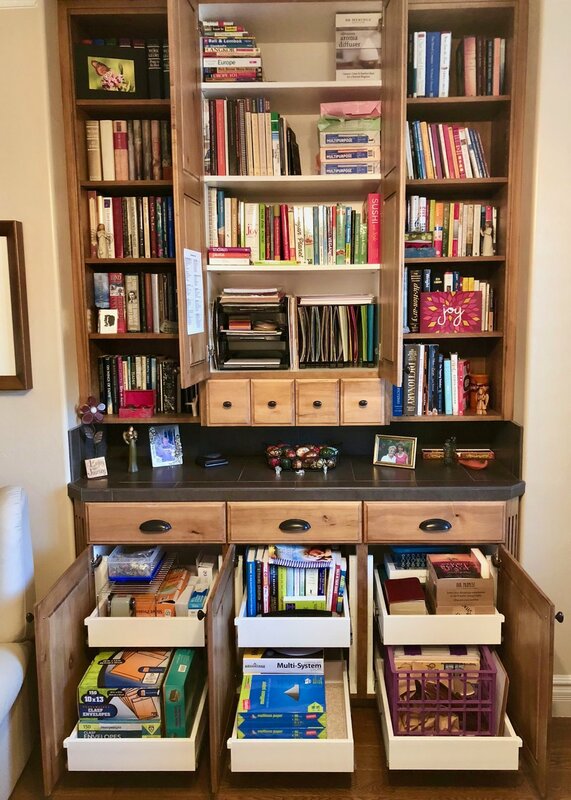 Lately I have been in the pursuit of making our storage spaces more usable and functional, so for my birthday I had pull-out shelving installed in several cupboards in the kitchen and my office. I love them! I don’t have to get on my hands and knees anymore to dig stuff out from the back of the lower shelves. I set a record by completing one of my New Year’s resolutions on January 1st! How did I do it? Well, I didn’t wake up sick like I did on January 1st of 2017. Dr. Myron Wentz who developed the test for diagnosing Epstein-Barr virus infection, said “Families are living too short and dying too long.” There is much we can do to reverse this trend so we can live longer and die shorter—one is simply move our bodies. At this time of the year, much of the population recommits to incorporating exercise in their lives so I want to share one form of exercise I really like. Miranda Esmonde-White, author of Aging Backwards, created an exercise routine called Classical Stretch which is designed to rebalance our bodies, increase mobility, and keep joints healthy and pain-free. You can find her on PBS. Apparently her television workout series has been the #1 fitness show on Public Television for over 18 years. She believes, “The human body is designed to age, slowly not rapidly. We’re designed to stay young well into our senior years. Gentle, regular exercise is all you need to do to keep your body feeling young.” Miranda Esmonde-White seems to be one who is aging backwards because she is currently 69-years old and still going strong! The Christmas season is upon us, which brings me to one of my favorite things—an organization called Kiva. Kiva is an international nonprofit, founded in 2005 and based in San Francisco. Its mission is to connect people through lending to alleviate poverty and to help individuals create a better future for themselves, their families, and their communities. Kiva has a 97% repayment rate. My husband and I have contributed to 10 loans and so far we have experienced 100% in repayments. Many of us have access to everything we need to live a happy and productive life. So to offer a loan to someone in need in the name of a loved one can be very rewarding on many fronts. When I choose a loan, I try to look for something in common between the individual seeking a loan and the person to whom the loan will be dedicated as a gift. For example, we have a friend who has a passion for helping female, non-traditional students get access to higher education. As a Christmas gift to our friend, we combined our efforts with 20 other lenders and contributed to a loan for Sara, a woman (age 30) living in Lebanon, to help pay tuition costs so she could receive higher education. Over the past year she has repaid 91% of the loan and she is scheduled to pay it off entirely in the beginning of 2018. By lending as little as $25, anyone can help a borrower start or grow a business, go to school, access clean energy, or realize their potential. For some, it’s a matter of survival, for others it’s the fuel for a life-long ambition. To learn more about Kiva go here. Click here to watch a two minute video about Flordelisa, a hard working woman in the Philippines, who received a Kiva loan. Her family has been greatly blessed as a result. If you are looking for a way to pay it forward, I invite you to consider a Kiva loan. Years ago I added essential oils to my arsenal of natural remedies. Although I initially got into oils to add to our emergency preparedness supplies, I have have since incorporated them in my daily health routine. 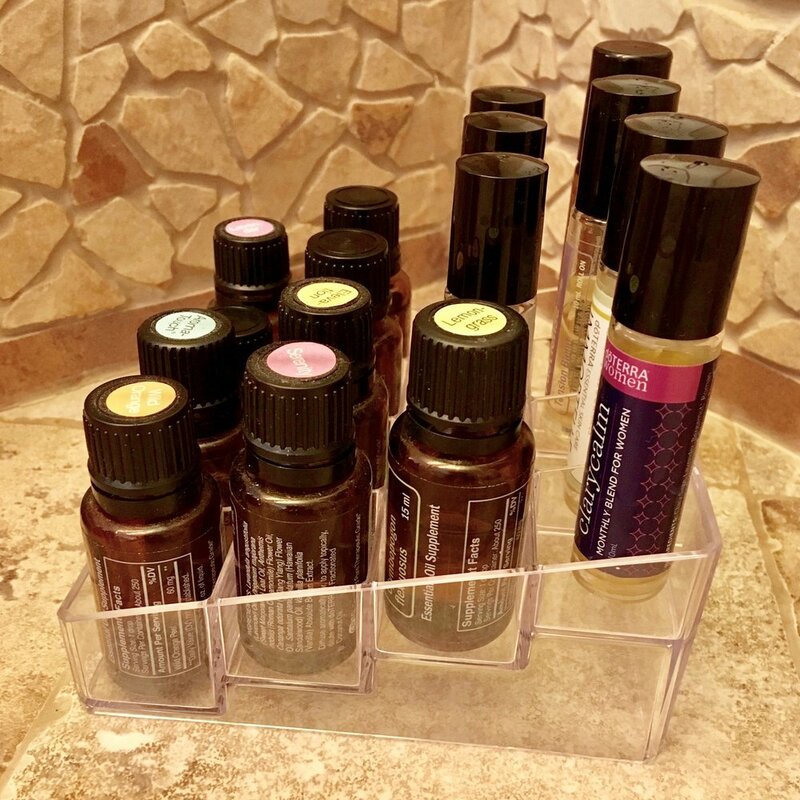 I had little bottles all over my bathroom vanity until I found these very handy containers at my local dollar store. Now my vanity is much more tidy and organized. Yay! If you would like to learn more about essential oils, feel free to contact any of the following practitioners. I know them all and they are competent in their knowledge of essential oils and how they can be helpful in improving and sustaining good health.